There is a gap. As a Hemodialysis patient you may have noticed it, and thought, "What if I become unconscious or begin to bleed-out? Will Emergency Medical professionals damage my fistula arm while attempting to help me?" The answer is unfortunately, "Maybe." Each Order is one (1) set of five (5) bands. Hence Quantity 1 = 5 Fistula Protector Wristbands. There is a gap. As a Hemodialysis patient you may have noticed it, and thought, "What if I become unconscious? Will Emergency Medical professionals damage my fistula arm while attempting to help me?" The answer is unfortunately, "Likely not." What's more is that when you are in the hospital, accidents can happen. Dialysis patients are a small minority, and many Healthcare professionals may not notice or know what a fistula is. This could lead to mistakes such as blood being drawn or blood pressure cuffs being placed on your fistula arm which could cause your lifeline (fistula) to fail. Hemodialysis access failure is a major cause of hospitalization and death. But, now there is something YOU can do. 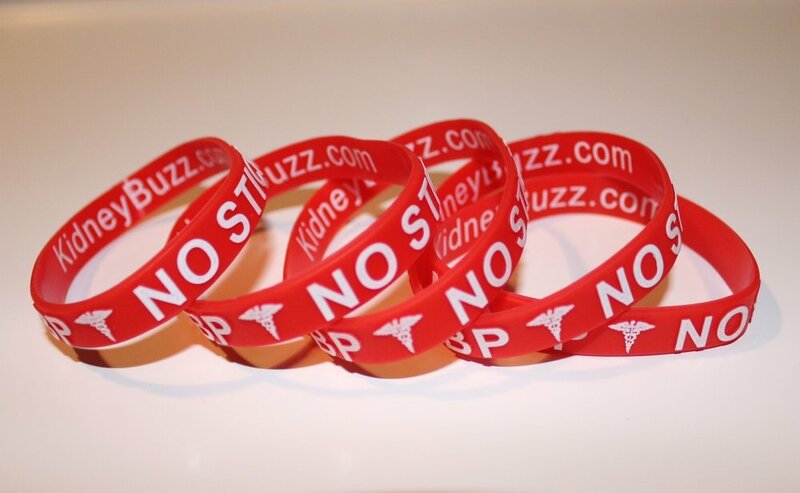 KidneyBuzz.com is working along with Healthcare Professionals, Emergency Medical Services (EMS), Nurses, and Doctors to protect Dialysis patients' fistulas by looking-out for this No BP/No Stick alert wristband. Now, we just need patients wearing them. Get your No BP/No Stick wristband to help ensure the protection of your fistula arm, and avoid painful fistula replacement surgery or worse. Your personal information is safe with us. When you enter sensitive information such as a credit card number on an order, it is processed directly through Stripe - a leading, world-class, and highly trusted credit card payment authority. Learn more.